With a population of just eight million people, Israel has an estimated 200,000 vegans, the majority of whom live in Tel Aviv. So it is no wonder why Tel Aviv has such a wide variety of vegan restaurants, from burger joints to Georgian cuisine. 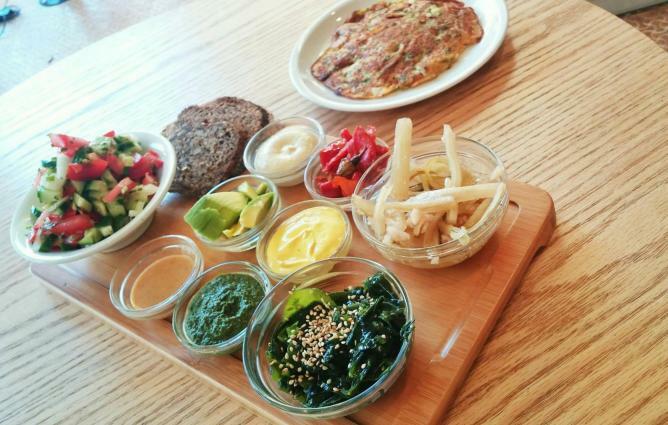 Here are the ten best places for vegan meals in Tel Aviv. The story behind Nanuchka is just as interesting as the menu. For years, the restaurant served traditional Georgian cuisine of meaty dumplings, cutlets, and stews.. 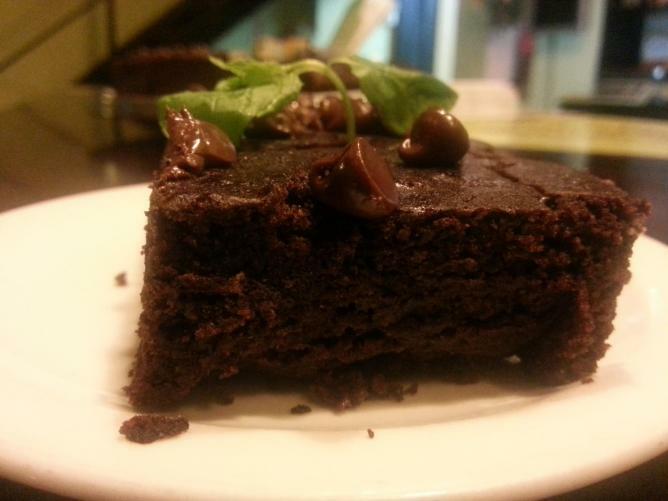 But when owner and chef Nana Shrier became vegan in February 2014, so did her restaurant. 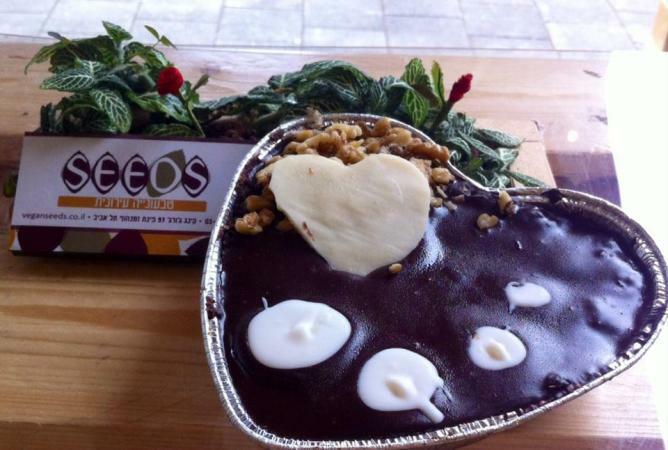 Now it carries the proud title of ‘the first Georgian Vegan restaurant,’ where Shrier can be found frying spinach and bean cutlets instead of chicken, and stuffing traditional Georgian pastries with mushrooms instead of minced beef. One thing has remained the same though: the nostalgic décor with red walls adorned in Nana’s favorite poetry and Communist Era memorabilia. Buddha Burgers is the quintessential burger joint to satisfy those meatless fast-food cravings. Their menu offers a variety of made-to-order veggie burgers made from savory mixtures of rice, quinoa, and beans. While most regular burger joints in Israel don’t serve cheeseburgers due to Kosher dietary laws, Buddha Burger will garnish your meal with as much soy cheese as your heart desires. When planning a visit, make sure to leave room for their creamy mousse dessert. Zakaim feels more like a farmers’ market than a restaurant, with several wooden crates of fresh, colorful vegetables sitting on display near the open kitchen. Once visitors are seated however, it begins to feel more like an older relative’s home thanks to the vintage furnishings and mismatched china patterns. 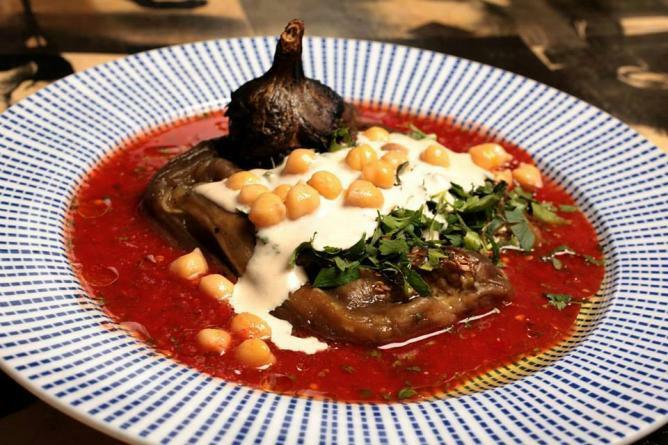 One look at the menu proves that it is undoubtedly a vegan paradise with meatless, dairy-free takes on stuffed cabbage, Iranian freekeh, and even Caesar salad sans anchovies. The only thing you can’t ask for is a straw: Zakaim doesn’t use any plastic products, out of its commitment to protect the environment. Anastasia wins points for creating a healthy blue colored tahini. The secret to the blue tahini’s color is spirulina, a food supplement made from blue-green algae (it tastes and looks better than it sounds). Other menu items are nearly as colorful, including the mixed purple cabbage, carrot, and kohlrabi salad and soy-based fruit shakes in a variety of pastel shades. The restaurant also sells several of the ingredients they use in case diners feel inspired to make their own blue tahini. Taste of Life is an amazing dining experience due to the community of people who established it: The Black Hebrew Israelites. They are a group of African Americans primarily from Chicago and other U.S. cities who believe they are the decedents of ancient Israelites. Among their many beliefs, they practice veganism—and it shows. Their menu, which might have the most options of all of Tel Aviv’s vegan eateries, offers hearty sandwiches, savory stir-fries, and chewy baked goods. 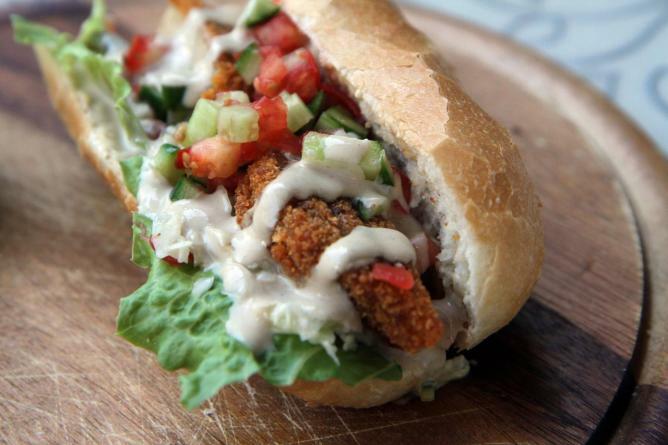 Many of the dishes contain seitan, a commonly known vegan junk food, but can be made-to-order without. 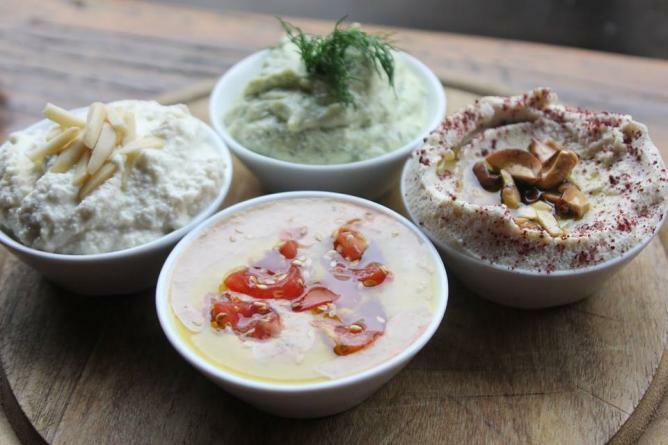 Israelis are used to scooping up soupy dishes like hummus and tahini with warm flatbread pita, no utensils necessary. The same rule applies at Tenat, only the cuisine is distinctly Ethiopian. If you’ve never had Ethiopian cuisine before, the best item to order is the bayonet, which is a tapas-like collection of dishes ready to be sopped up by injera, a spongy flatbread with a sourdough flavor made from teff flour (which is gluten-free). 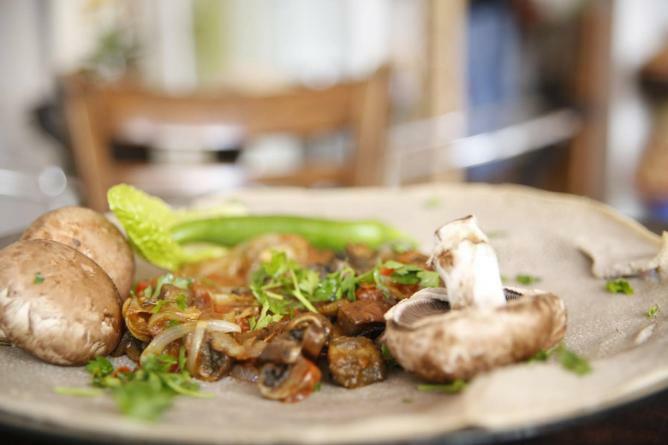 Bar-Kayma is Tel Aviv’s vegan hipster hangout located in the hipster enclave of Florentin. Bar-Kayma serves a bit of everything from pasta, to veggie burgers, to traditional Mediterranean dishes of eggplant and tahini. They even boast the ‘Plate of Abundance,’ a colorful stew with rice and a side salad. But even more exciting and filling are the Bar-Kayma shakes. While delicious, do not mistake them for a light, refreshing smoothie. They are more like a milkshake and definitely worth a try as long as you plan your next meal accordingly. Traditional Middle Eastern shawarma is a giant rack of lamb, turkey, chicken, beef or mixed meats that rotates on a spit until it’s carved into a pita or on a plate, not exactly ‘vegan friendly’. But The Veg Shawarma has changed all that, by creating a spicy selection of tofu and seitan-based ‘meats’ to wrap up in your favorite bread, with choices like focaccia, pita, tortilla, or a bun. While these shawarmas are more of a junk food than a wholesome meal, vegans can’t be expected to eat healthy all the time, and the Veg Shawarma is happy to help them indulge. Most vegans would agree that the hardest food to give up is pizza. Luckily, Tel Aviv vegans don’t have to miss out thanks to Hatool HaYarok (The Green Cat), a brick-oven vegan pizza place. While it’s hard to imagine that cashews can be manipulated to anything that resembles cheese, Hatool HaYarok does this brilliantly with their cashew-based ‘Mozzarella’. Add your own combination of fresh veggie toppings to complement the flavors of the Mozzarella, and you have the perfect vegan pie. When the smell of warm, freshly baked pastries wafts into the street, the natural reaction is to swivel your head around until you find the source. For vegans, however, that inviting smell is usually a cruel tease, as most bakeries don’t make vegan goods. Seeds, on the other hand, is a bakery for vegans. Designed for takeaway, it’s easy to get your fix with one of their brownies, crème cakes, cookies, or even a savory option like pizza and burekas. You can also order a specialty iced coffee to combat the Tel Aviv heat.